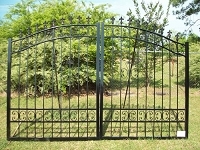 This gate is a beautiful hand crafted,all welded design. 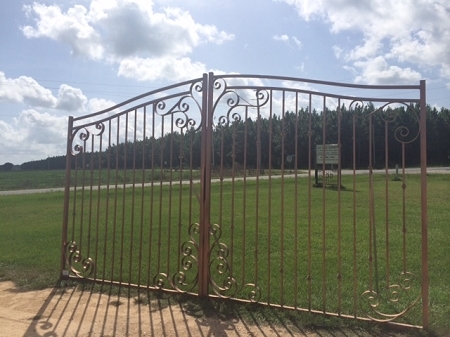 The gate will come 5' tall arching to 6' in the center (unless otherwise specified), CUSTOM WIDTHS AND HEIGHTS ARE AVAILABLE. This design will come complete with two 4" x 100" long gate posts with adjustable bearing hinges and heavy duty slide bolt latch. It will come finished an Acrolon Industrial grade semi gloss black painted finish (color can be changed during checkout process,if you don't see your color let us know as we have many custom colors available). 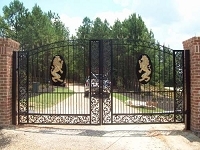 **ALL OF OUR GATES ARE PROUDLY MADE IN THE USA! 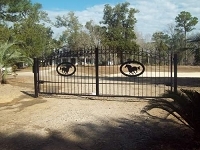 ** FREE SHIPPING TO THE LOWER 48 US STATES ON ALL DRIVEWAY GATE PACKAGES!! Copyright Gulf Coast Gate and Fence. All Rights Reserved. eCommerce Software by 3dcart.